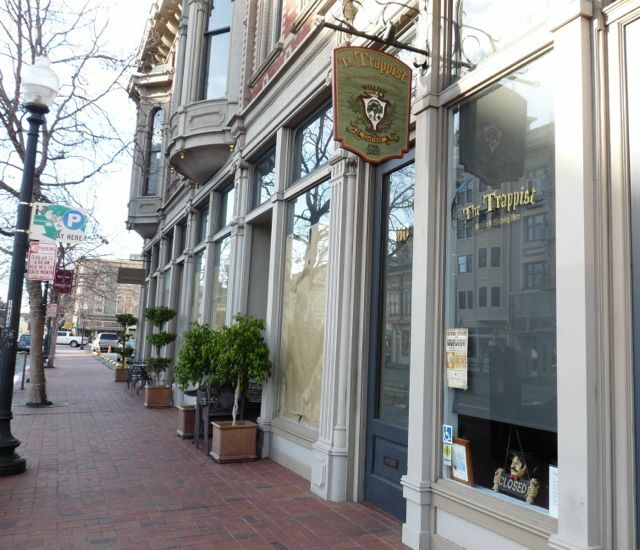 The Trappist burst upon the Bay Area beer scene in December, 2007, and has since expanded into the adjoining store front. They specialize, as their name might suggest, in Belgian beers, on tap and in the bottle. They also pour a few select local craft beers on tap. The Victorian touches and dark wood give it a European feel. They have about 20 taps and an extensive bottle list.The front and back bars have different beer selections but you can order from either bar wherever you are seated. This is a place for beer lovers and for those who want to learn about beer. When words aren’t enough to help you decide, they will pour you a taste or two before you order. Conversation is encouraged, with no TV or loud music to impede socializing. We really like that they will serve 5 ounce flights allowing you to try different beers. They serve a light food menu and are open for lunch during the week. Extras: Look for their excellent special tasting events. They are 2 blocks from Pacific Coast Brewing, 5 blocks from Beer Revolution and a one-stop BART ride from Luka’s, if you want to design a pub-crawl. Exit BART thru Exit A1. Walk down Broadway to 8th Street, turn right (west) just a few doors and you’ll find The Trappist on your right. Official 12th St. BART Station and connecting transit Info. Allagash beers with master brewer Rob Tod, Malheur beers with cheese and chocolates, and a Tripel Karmeliet night. Whew. You forgot to add “radio Bar” for the 12th Street station – Radio Bar is on 13th Street around the corner from 12th street station.